The New Zealand we believe in is one where the hopes of refugees and migrants arriving in any New Zealand community are realised with welcome and safety. It’s one where our Muslim whānau who have long been part of Aotearoa New Zealand would remain safe. Let Friday be one of our darkest days, but one that we vow never to let happen again. Let’s not give extremists the power to change who we are for the worse – let this be a chance for us to grow stronger, more committed to what is important to us, and to create every single day the communities that we want to live in. Among our Muslim whānau are families that have come to New Zealand seeking safety, seeking shelter from persecution and conflict. One family at a time, our volunteers and staff have been learning the stories of escape, and of hope for peace sought by people reaching New Zealand. The New Zealand chapter of these stories was about neighbours helping neighbours by showing warmth and welcome as, one family at a time, our new whānau were beginning to rebuild their lives. We must continue. Together, we make New Zealand what it is: a land of welcome, respect and openness. This demands each of us make this vision real, and that we challenge injustice wherever we see it. 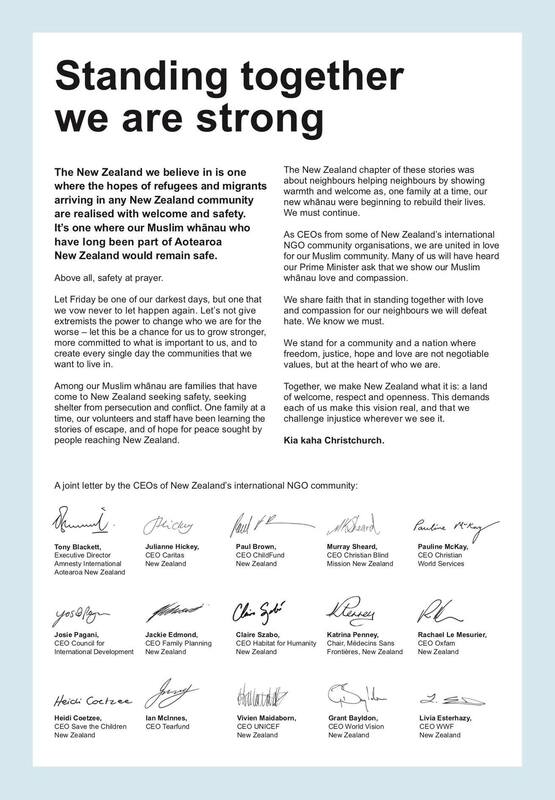 A solidarity letter in the wake of the Christchurch shootings.